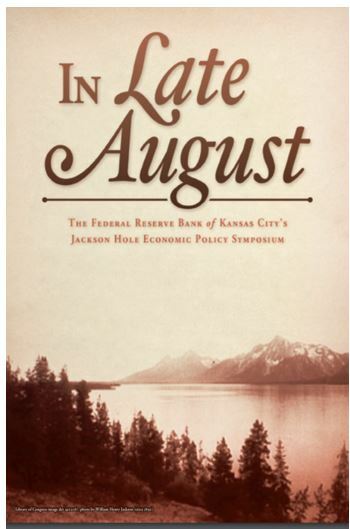 Every August, economists from around the world converge on Jackson Hole, Wyoming for one of the most important conferences of the year. Many years, the Chair of the Federal Reserve addresses the audience. This year, according to CNBC, Federal Reserve Chairman Jerome Powell said “he expects a slow but steady diet of interest rate increases to continue as the central bank looks to find the right recipe between promoting growth and controlling excesses. In his closely watched speech at the Fed’s annual retreat at Jackson Hole, Wyoming, Powell expressed confidence in the economy and said he does not see inflation getting out of hand. As a result, the current trajectory the Fed has been following since December 2015 is unlikely to change so long as there aren’t any significant changes to economic trends. The central bank, he said, is focused squarely on not stepping in to halt economic momentum but also wants to be a bulwark against runaway growth. “As the most recent FOMC statement indicates, if the strong growth in income and jobs continues, further gradual increases in the target range for the federal funds rate will likely be appropriate,” he said. At several points in the speech, Powell referenced former Chairman Alan Greenspan’s leadership of the Fed in the 1990s. In particular, Powell noted that Greenspan waited for evidence of inflation before acting, leading analysts to believe Powell may be nearing an end to the interest rate hikes. “The takeaway from Jackson Hole is that the Fed may not look to tighten much more than is currently priced into markets,” Mark McCormick, North American head of FX strategy at TD Securities in Toronto told Reuters. These analysts concluded that traders should take a “risk on” approach to the markets based on Powell’s comments. A risk on approach involves investing aggressively. Risk on and risk off are considered to be trading strategies by traders. Risk on is aggressive and risk off is more conservative. Hedge funds tend to follow this strategy which is widely referenced in the media and is usually considered to be a short term strategy in the markets. In the U. S. markets, a risk on environment indicates investors should consider increasing exposure to small cap and tech stocks. Investors can increase exposure to small cap stocks with a single exchange traded fund, or ETF, if they choose to. Among their options are the iShares Russell 2000 Index Fund (NYSE: IWM). The chart below shows this ETF is in a strong up trend. While many investors may consider new highs to be a sign that a stock or ETF should be avoided, the truth is new highs often lead to more new highs. This can be seen by looking back to March 2017 in the chart above, a time when IWM reached new highs. A blue arrow highlights that area. IWM broke out of that consolidation, pulled back and then began reaching a series of new highs. While there were occasional declines, for the most part prices moved higher. The breakout from the consolidation, in hindsight, was an ideal time to buy. On the right side of the chart, the most recent price action shows that IWM has again broken out of a short consolidation and could be moving towards more new highs. Now could be an ideal time to buy with a stop near the recent lows which would be below $165. To obtain exposure to tech stocks, the Invesco QQQ Trust (Nasdaq: QQQ) could be used. This ETF tracks the Nasdaq 100 index which includes the largest tech stocks trading on the Nasdaq system. The chart below shows that prices recently broke out of a consolidation. Risk Beyond the U. S.
Some traders will want to look beyond the U. S. for their portfolios and here they may find emerging markets to be appealing. Emerging markets are an asset that tends to rise during risk on periods. This all points to potential gains in emerging markets. Investors can gain access to these markets with another ETF, iShares MSCI Emerging Markets ETF (NYSE: EEM). This ETF has been in a pullback as the chart below shows. Analysts have been increasingly bullish on these markets. LPL Research noted, “We’ve emphasized before that we expect the economic growth rate for emerging markets (EM) this year will be the highest for any global region, and we still believe this is the case, even amid currency turmoil. Risks are important to consider with this and any investment. 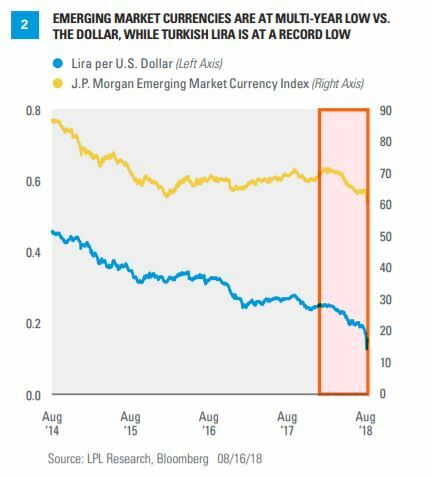 Among the most important risks to consider is Turkey where the currency has reached new all time lows. Even after considering the risks, many investors may find EEM to be attractive, especially in a risk on environment. Eventually markets will transition to a more conservative position but for now, analysts seem to be bullish and investors can consider becoming aggressive in this environment. The Fed is often the key to the “risk on / risk off” background and until Chairman Powell turns bearish in his comments, the market is likely to deliver strong gains in aggressive sectors including small caps, tech stocks and emerging markets.